alaTest har samlet og analyseret 87 anmeldelser fra magasiner og hjemmesider. Mange kan virkelig godt lide størrelsen. Også kvaliteten imponerer, men zoomen værdsættes ikke af folk. Vi analyserede bruger- og ekspertratings, produktalder og andre faktorer. Sammenlignet med andre Videokameraer får DJI Osmo en samlet alaScore™ på 95/100 = Fremragende kvalitet. DJI's Osmo is pretty much the most complete hand-held gimbal in the market right now. This may be DJI's first attempt at making a hand-held gimbal, but it's already by far one of the best, if not the best, solutions in the current market. Great stabilization, intuitive software and comfortable grip make this a fun, complete package. The three-axis gimbal turns an Android or iOS phone into a steady movie maker complete with subject tracking and full camera control. The DJI Osmo camcorder captures steady 4K footage, even when handheld, but battery life and audio quality are concerns. Sharp 4K footage. Raw and JPG still capture. Steadies handheld video. Directional pad for smooth camera moves. Log color profiles. Limited battery life. Poor microphone quality. Lacks close focus capability. Doesn't zoom. 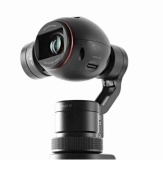 The DJI OSMO offers a whole new way of shooting video handheld. The design is simple but effective and the video quality is really good too. It's perfect for one-person videography.